Join us in paradise for a full week of training in health and happiness! Koh Lanta is already known for it's chilled out, relaxing vibe and Oasis Yoga Bungalows specializes in just that. Yoga, mediation, healthy meals, hammock lounge, epic sunsets, green juices, and of course the soul cleansing waters of the Andaman Sea. What more do you need to unwind and recharge your practice! 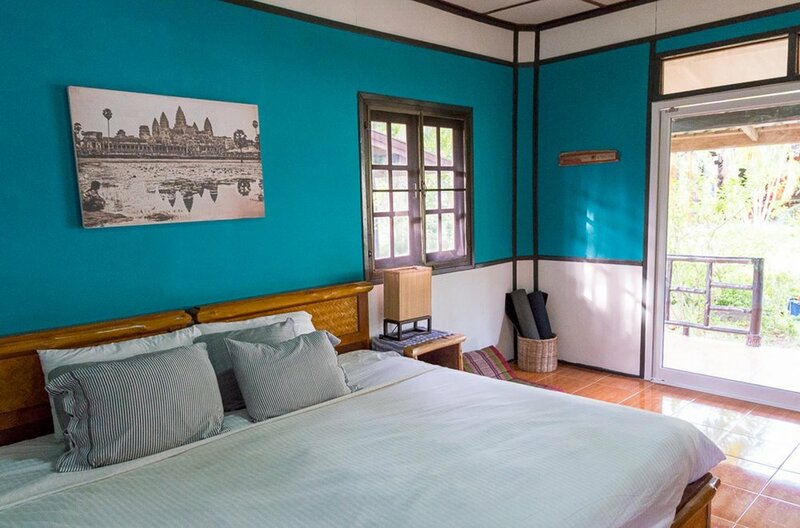 Oasis Yoga Bungalows sits 1 min away from the stunning Klong Dao beach on Koh Lanta island. There are 23 bungalows surrounded by the green of tropical plants. Many bungalows sit facing the pool and chill out lounge area and others are tucked back into the garden. Each bungalow is uniquely decorated to leave you feeling super cozy and right at home. Our Yoga Shala is a large open air, thatch roof tree house that catches cool breezes from the sea. Early morning classes are such a lovely way to connect to nature as the island wakes with the sounds of a variety of tropical birds. Most bungalows are the same size but can be set to either one king bed or two twins. If choosing to share we'll mindfully pair you with the most suitable person we can should you be traveling alone. All rooms include ensuite toilet, hot water shower, a/c, fan, and outdoor seating area. For those who prefer their private space a bit more. There's a desk for journaling and plenty of space to roll your mat out if you just can't stop yourself from yoga-ing. All rooms include ensuite toilet, hot water shower, a/c, fan, and outdoor seating area.